Support 0%-100% dimming range, this bulb is designed to provide quality dimming to create the right ambience for any activity, from relaxed to active atmospheres. The more you dim, the warmer the light. 11W Power Consumption for each incandescent bulb,each strand of Classyke String Lights support 960W Power Consumption, so you can link 5 sets to achieve the perfect length for any installation. Classyke outdoor string lights is built with durable WeatherTite Technology to protect your outdoor lights from damage caused by extreme temperatures and weather conditions. The rubbery cord is thicker than a traditional cord so that you can be confident in leaving your lights on display year-round. ⚠️ Attention: The string lights are dimmable, to dim the string lights, you need a dimmer switch like all the other string lights do. ❄️ Safety Comes First: UL Certified adapter and cable for permanent indoor and outdoor installation, and designed to withstand the elements so you only have to set them up once. ❄️ Weather Resistant: Dust, sun, rain, wind and snow resistant, confidently leave on display through summer and winter all the year round. ❄️ Easy To Install: These lights are easy to install with a convenient loop on each socket for easy installation with eye hooks or zip ties. 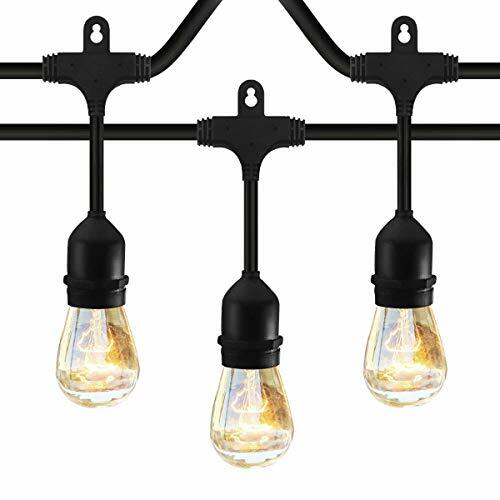 ❄️ Wide Use Occasions: This string lights is perfect for indoor outdoor use, patio, bistro, deck, pergolas, gazebos, home accents, camping, market, Christmas, parties, wedding or bedroom, bringing you a fantastic moment. ❄️ Two-year Warranty: We offer two-year warranty longer than those who only offer six months or one year warranty, customer satisfaction is our top priority, please don't hesitate to contact us if there is anything wrong. The bulbs are made of glass, they are fragile during shipment. If you get the defective bulbs, please feel free to let we know, we will arrange the replacement bulbs to you for FREE. If you have any questions about this product by Classyke, contact us by completing and submitting the form below. If you are looking for a specif part number, please include it with your message.